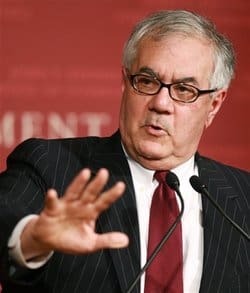 Congressman Barney Frank has never been afraid of speaking his mind. And now that he's retiring, the Massachusetts-based lawmaker can really let loose. That's precisely what he did in a recent sit-down with the Washington Blade. In addition to discussing his own coming out and why it would be "political suicide" for liberals to abandon President Obama, the outgoing politico offered his thoughts on transgender opposition to a recent Massachusetts law that add gender identity to the state's non-discrimination regulations, yet still allows hotels, restaurants and other public spaces to turn trans people away. Frank: An issue to whom? Blade: Some of the more outspoken trans activists, who say they are outraged because it includes employment, housing and other protections but not public accommodations protections. Frank: No, I would say ridiculous trans activists who are outraged, who would prefer there be no rights for employment than this. That is an example of their political stupidity. They may be very bright about other things. I don’t see how anybody can see that as a rational argument right now, nor, by the way, do I think it represents five percent of our community. I don’t even think it represents a majority of the transgender people. How can it possibly be – and by the way, these people don’t know history, because I will tell you that Martin Luther King and the other civil rights leaders would not for a second have hesitated to accept that deal. They were constantly moving toward making things better but those are both examples, I think, of the political maturity of our community – of knowing how to go about it. Frank also offered his thoughts on Republican presidential hopeful Mitt Romney. The former Massachusetts governor is a "faker," says Frank, as if we didn't already know that.